For most Americans, driving is a way of life. Whether you’re commuting to work or embarking on a 10 hour road trip, you have to interact with drivers from all over the country. As such, driving popularity in the U.S. is on the rise, as the number of people with a driver’s license rose steadily from 1988 to 2010. In 1988, around 163 million people had licenses to drive, and by 2010, around 210 million people had licenses drive. With more licensed people on the road, the added risk of accidents, increase in traffic laws and increase of those breaking traffic laws. Below are the 10 most commonly broken driving laws in Texas, and how you can best avoid getting a ticket. In Texas, one of the most common tickets involves a moving violation. Why? They can be especially popular when police officers are trying to reach end of the month quotas. The maximum fine for running a stop sign or red light is $200 in Texas. If caught on camera running a red light, it’s around $75. The best way to avoid these hefty fines is to pay more attention to lights and signs. Though in Texas it is not illegal to drive through a yellow light, when driving, learn how to better control your speed and be more aware of your surroundings. If you approach a yellow light, it may be smart to slow down and quickly gauge if you can make it through the intersection before it turns red. Better to be stuck at a light then getting a ticket just a block ahead. According to Texas Department of Transportation, 1 in 5 crashes involve driver distraction. Though there are no statewide laws banning cellphone use, drivers need to be aware of cellphone laws that vary city to city. The three types of cell phone ordinances in Texas include: ban on all wireless communication devices while driving, ban on texting while driving and ban on texting and other manual uses of cellphones while driving. Fines for using your phone when these bans are in place range from $200 to $500. 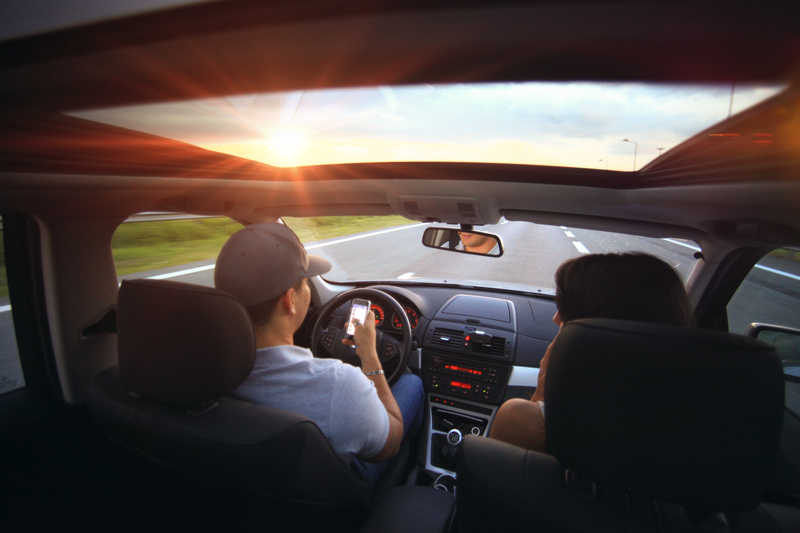 As a driver, know what cellphone ordinances affect the towns or cities you drive in and as the Texas Department of Transportation recommends, drive now and talk later. If you must make a phone call, pull over. It’s a state law to always wear a seatbelt while in a car. Fines and court costs can be up to $200 when not buckled. What’s more is that your safety is in jeopardy every time you don’t wear a seatbelt. According to Texasclickitorticket.com, Texas currently ranks seventh in the nation for overall seat belt use. Though that’s great news for Texas drivers, it’s still one of the most commonly broken driving laws. Driving under the influence is a serious offense, no matter what state you reside in. Texas prohibits those driving with a .08 percent or above blood alcohol concentration (BAC). For commercial drivers it’s .04 while under the age of 21 is .02. The best advice, don’t plan to drive after drinking. By doing so, you put your driving freedom, life and finances at risk. First time offenders are arrested, fined up to $2,000, get their driver’s license revoked for 90 plus days and confined to jail for 72 hours to 180 days. Though it could happen to any driver, it’s important to always have a valid driver’s license on you. If you find yourself pulled over and no driver’s license, you could receive a $200 fine, with the fine increasing every time you violate the law. In Texas, offenders may have to pay other fees and costs for driving without a driver’s license. As a driver, get in the habit of carrying a wallet everytime you get in a car or better yet, keep your driver’s license in a safe spot within your car, such as the glove department or other consoles. Though driving without a license is expensive, it’s not as costly as driving without car insurance. First time offenders can face a fine up to $350. Plus, when you next visit the DMV, you’ll be hit with a surcharge for driving an uninsured vehicle for the next three years. A second offense is higher fines and you may have your car impounded. As of 2015, Texas requires the following insurance amounts: $25,000 property damage; $30,000 personal injury (per person) and $60,000 personal injury (per accident). In short, make sure you have valid car insurance before you drive your car. Speeding is one of the easiest laws to break while driving, especially since most if not all drivers drive above the speed limit one time or another. A first time violator may be fined between $1 and $200 and if a more serious offense, the violator’s license may be suspended. It’s important to remember that Texas uses a presumed speed limit law, where it’s legal to drive over the posted limit, as long as you are driving safely. Defensive driving courses, such as defensive driving El Paso TX can help those with a speeding violation history become a more conscious and safer driver all while dismissing a ticket or keeping insurance rates down. In short, brush up on parking laws for the cities you plan on visiting, and remember that large metropolis areas often have higher citations and fines for illegal parking. Street signs are also good to read before walking away from your car. In Texas, drivers must use headlights at night time and when visibility is less than 1,000 feet. A good rule of thumb, keep your headlights on 30 minutes after sunset to 30 minutes before sunrise. Not only does good headlight use keep you safe, it also can keep you from getting a ticket. Lastly, it’s important to know your U-turn laws. In Texas, these laws are very minimal. Texas traffic codes indicate that you can only make a U-turn if you can clearly see at least 500 feet both in front and behind you. If you can’t safely make the turn, don’t do it. If you make an unsafe turn, the more likely an officer can give you a reckless driving ticket. When you do intend to make a U-turn, make sure it’s safe and legal to do so. Take these rules to heart the next time you get into a car and remember the key to avoiding tickets is safe and responsible driving.